What’s a Hoosier? I grew up in Indiana, and for most of my life, I didn’t even know what the word meant – to me, it was just the nickname for Indiana University’s sports teams. When I hit adulthood, I took it upon myself to look up the origins of the word, and learned that the term into common usage in the 1800s, likely by way of a poem called “The Hoosier’s Nest,” by John Finley. There are plenty of theories about where the word itself originated, but nothing is certain other than it probably was a word created from use of another phrase or couple of words. Whatever the actual word origin, it has long been known as a positive thing to be called a “Hoosier,” as it tends to refer to people who are hearty, rugged, intelligent and enterprising. So, it makes sense that Hoosiers would enjoy a nice, hearty beer every now and then. Indiana is home to more than 150 breweries, so picking the “best” beers would be a tough sell to any crowd. But here are five worth seeking out, especially if you find yourself in the land of Hoosiers and aren’t sure where to turn to quest your thirst for craft beer. 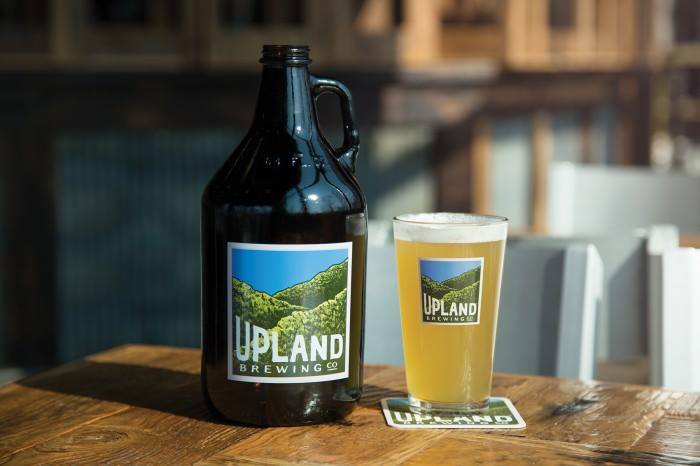 Upland Wheat Ale, Upland Brewing Co. (Bloomington): Upland Wheat was one of the first Indiana beers I ever got to know, so I had to include it in this list. Founded in 1997, Upland was giving the people of Indiana the flavors of better beer well ahead of the wide use of the term “craft” for beer. This Belgian witbier is a modern version of a classic, brewed with organic coriander and orange zest to add some spice and tartness. The hazy, golden brew is one of those you can enjoy whether you are hanging out with friends or just mowed the lawn, and at 4.7 percent alcohol, you can have a few without worry. Ask just about any Hoosier, and this may be the closest Indiana has to a state beer. Wee Mac, Sun King Brewery (Indianapolis): A Scottish ale, sometimes known as a wee heavy, isn’t usually a craft brewery’s first choice for a core offering, but when people think about Sun King, most of them think Wee Mac. Far from the hopped-up modern beers, this one has been around for a while, and tempts the palate more with malt sweetness and a hint of spice than with complex bitterness. The malty brown ale conjures hazelnuts, toffee and caramel, and is a smooth sipper at 5.3 percent alcohol by volume. It’s easy drinking enough for summer, but has enough malty body to keep close by in colder months. Thank goodness this Indiana staple is available all year long. Lift Off IPA, Daredevil Brewing Co. (Indianapolis): It was inevitable that we’d get around to this one, named the best Indiana beer in an Indianapolis Times reader survey. If the distinctive racing-helmet logo design doesn’t hook you, this classic West Coast-style American IPA’s dependability will. This is a clean and crisp IPA that is accessible to plenty of palates, but also offers up enough of the IPA bitterness – the can says it’s “brewed with a bounty of American hops” – to keep the hop-lovers coming back. Enjoy the malt-hop balance and enjoy it slowly, as its drinkability might fool you into thinking it’s less potent than it’s 7.2 percent ABV. It’s an Indiana experience in a glass (or two). Hoosier Daddy, New Albanian Brewing Co. (New Albany): Hoosier Daddy is the dark horse on the list, as it’s not particularly well known across the state but sure does exemplify what it means to be a Hoosier. The beer is a unique, smooth cream ale with a bit of a twist in that it’s sort of an amber ale and cream ale mashup. That gives the brewery all the ammunition it needs to call it a “cream and crimson ale,” which echoes the cream and crimson school colors of the state’s university sports teams. Another kicker is that the beer gets its unique flavor from flaked corn, setting it apart from other amber (sorry, crimson) and cream ales in its class. Hoosier Daddy also is brewed with lactose sugar for extreme creaminess. This is a beer even John Mellencamp would be proud of.